Hello all! 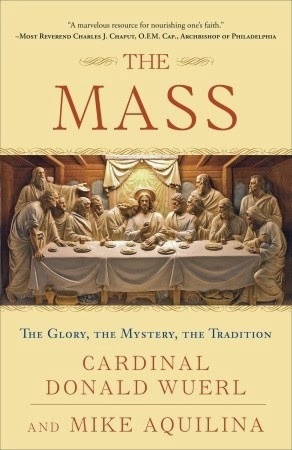 Reporting in with another review for Image Books, and this one is an excellent lead up to Lent : The Mass: The Glory, The Mystery, The Tradition, by Cardinal Donald Wuerl and Mike Aquilina. I don't know about any of you, but when I was a child, I thought Mass was very, very...boring. I "didn't get anything out of it," I thought to myself, and thus it was no big deal to not go every Sunday. As I grew in maturity and years, I came to long for a much deeper understanding of my faith, and as a result of my study have come to love and revere the Mass. If anyone is wanting to learn more about the Mass - it's foundations, the meaning of the different elements and traditions, why particular wording is used in the liturgy - this is the book for you. The first section discusses items that I fully expected, such as the Biblical foundations of the Mass, it's historical development, how one should prepare for Mass, and the roles of different people during the liturgy. But it also explores really interesting tidbits, such as the vessels and cloths used at Mass and the Church calendar. The latter part of the book does exactly as advertised, and does so in an engaging fashion. The authors address every part of the Mass, from the opening procession right through the blessing and dismissal. The chapters are short, many also containing photographs to illustrate, and thus can be read very easily in small segments as part of a nightly spiritual reading plan. Despite the serious subject matter, this is not "heavy" and difficult to digest book for lay Catholics to read. The authors do an outstanding job of keeping the text readable while conveying intricate detail. This is quite simply a lovely book to read. This book is available in both print and electronic form, with the trade paperback's list price at $14. Check your favorite retailer for a copy, it is well worth it. I hope that everyone is having a wonderful day. :) I have a miserable day tomorrow filled with three meetings (offering this up, #martyr!) so I don't know if I will blog or not. But you will hear from me Friday for 7 Quick Takes! This sounds like an interesting book! I love reading about things like this. I was raised in a Protestant environment, and as an adult we have joined a more liturgical church (Episcopal) I think it is so beautiful and meaningful to have these traditions. But Im definitely still learning, and when you learn the 'why' behind the things you do, especially in church, it makes them that much more important and reverent.